At Osage Cottage, the whole house is yours. 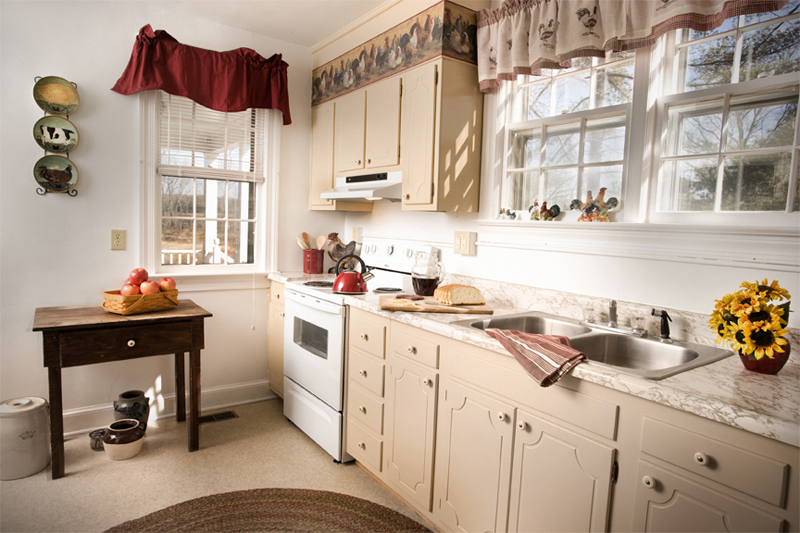 The full kitchen, complete with pots and pans, dishes as well as microwave and dishwasher, has everything you need to stay in for meals. You’ll even find the makings for a light breakfast or two in the fridge when you arrive. Out back, there’s a gas grill for barbecues. Osage Cottage’s accommodations include a TV and DVD player, along with a great selection of books, DVDs, board games, bikes and outdoor games to help you truly get away. Pack light because this home has a washer and dryer in the large bath upstairs. All linens and towels provided. * During your stay, you will be the only guests at Osage. You’ll never have to share the space! ** A two-night stay is required on weekends. We require a deposit equaling one night’s rent or 50% of total cost, whichever is greater, to guarantee reservation. For a stay of one week or longer, we require a security deposit of $250. Upon inspection of the property (within 48 hours of your departure), the security deposit will be refunded to you. Owners are required to control dogs while on the property. Dogs must be confined to a crate when left alone. Dogs are not permitted to lie on beds and only on furniture covered by a sheet or throw (provided). Owners are required to scoop pet waste. For a full refund of deposit, we must receive your cancellation at least 14 days prior to scheduled arrival. Guests cancelling without 14-day notice will receive a refund only if the property can be re-rented. For reservations, e-mail melinda@osagecottage.com, call (804) 633-7152 or fax (804) 633-7085. Rates subject to change without notice.